No paved roads for miles and miles. The camp was by a dry lake bed. We arrived just before sunset, just enough time for a shower before dinner. There was a very interesting demonstration by the camp cook on making a tajine meal. The next morning we had a pancake breakfast - Berber style. After some time to get things straight in camp we were on a 1 hour hike to a Berber family tent. The matriarch was widowed (her husband died in a truck accident moving the family tent) with 4 sons and 2 daughters. Two sets of twins died within 2 weeks of birth. The oldest son is 21 years, married with 2 children. His youngest is 2 weeks old that was delivered by the mother-in-law. The matriarch's 2 youngest children attend school and stay with a step-mother in the local town. One of the daughters was outside "baking" bread. Of interest here is the construction of the beignet stove. It is a hearth of tamped earth into which brush and small fire logs are put in one side and a smoke-hole allows smoke out the other end. It's all very rudimentary; a very ancient way of cooking. The hiking was now over. Driving (with air-conditioning) was the way to go in the hot sun. We spotted a mother and daughter at a well doing laundry, and stopped. The water wells are provided by the government. The depth can be from 10 to 90 feet deep. After about an hour or two of driving we again stopped at a Berber tent to visit. The mother just made some fresh bread which she offered to us along with mint tea. She had 4 young children with the oldest watching the youngest. Nearby was a huge hill of rocks - and fossils galore. The fossil rocks formed about 400 million years ago when the Sahara was a vast ocean. Great free souvenirs! It was a long drive back to camp for lunch. 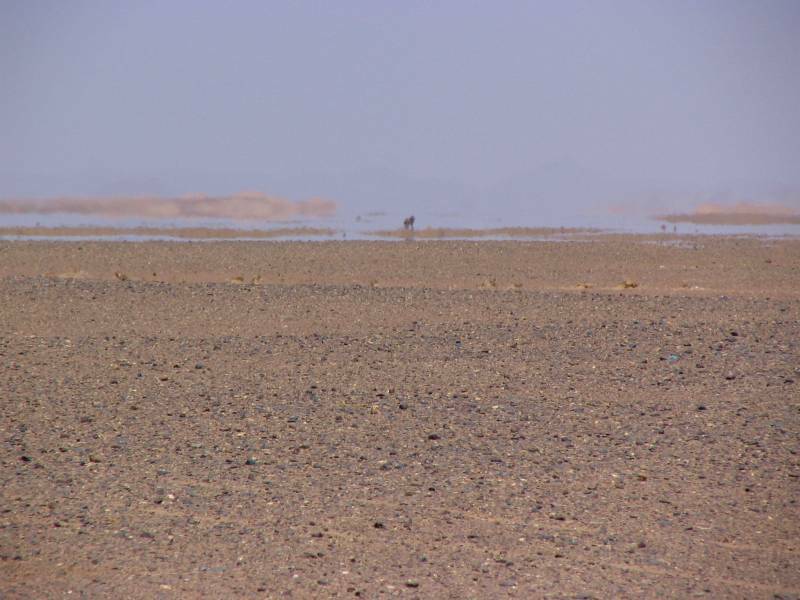 Here is a picture of a mirage in the Sahara. We had a free afternoon since nobody but me wanted to go on a 3 hour hike to the local mountains. The sun was hot but the shade was bearable. Kirsten and I then started doing laundry - washing clothes in a bucket then rinsing. Clothes dried in about an hour. Others in our group joined in to get some laundry done. At least it was a productive afternoon. Six of the group went on a hike to the dunes for the sunset. These are my best pictures of the Sahara. Back to camp for a shower, dinner (a goat), then some great music and dancing by us and the camp staff. No pictures since it was dark and I was having too much fun. Breakfast was pancakes again with tea or coffee. With a little jelly the pancakes were not too bad. There was some free time so Kirsten and I decided to take a walk to a nearby dune to get a good view of the camp. When we returned to camp we joined the group for a one hour hike across the desert almost to the nearest Berber hut. But the Land Rovers picked us up to drive the short distance. The Berber lady was widowed 2 years ago. She has 8 children with the oldest 20 years old. We had the usual bread and tea before leaving. As we approached a small village there was a Berber cemetery. The guide gave a short talk on the Muslim custom when there is a death. The body is usually buried in 24 hours - no embalming allowed. There was quite a few children that came to see us. They were fascinated with seeing their pictures on the digital cameras. Stones were placed upright at the head and foot of the body. No other marker was present. On the way to Alnif was a very interesting farm at the oasis Aït Quamor. The owner gave us a tour and explained the different crops. He had a diesel motor that pimped water from a shallow well to irrigate the fields. We did have a few rest stops for potty breaks. Driving through the J'bel Sarhro Mountains ( 4500 to 5000 feet) we saw very interesting green rocks and soil. Our resident geologist explained that the greenish look was from magma that came from the earth's crust under water and did not get oxidized. If the magma gets oxidized the rocks and soil has the typical reddish appearance. Another clue that this whole area was under the sea many millions of years ago. After 3 nights in the Sahara Desert, we finally had a hotel room in Tinerhir.